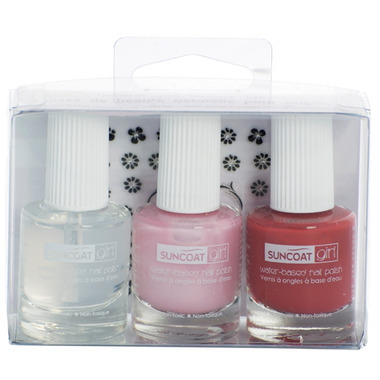 This Suncoat Girl Nail Beauty Kit with Decals is the ideal "try-me" pack or birthday gift! This three bottle set delivers fun and unique nail art designs with natural nail polish and nail decals. I guess this is great for kids, not so much for adults since it doesn't last at all and doesn't have a good pigmentation either. I liked this product because of its safety factor. However, the fact that it comes off too easily is definitely a minus. The polish on my toes lasted for a week, but the polish on my fingers began peeling off the very next day following application. Love it but not very long lasting and/or waterproof. After half an hour in the pool, most of it peeled off.